Marilyn Warzynski-Baranski, 80, Plymouth, passed away peacefully on Wednesday, March 7, 2018, in the Catherine Kasper Nursing Home Memory Unit. Mrs. Warzynski-Baranski was born on July 6, 1937, in Chicago, Ill. to Edward and Josephine (Majcher) Warzynski. She was a resident of the Plymouth area since the 1980’s when she moved here from the Chicago area. She was a cafeteria server for many years at the Lincoln Jr. High School where she made many friends. She will be fondly remembered by those who loved her. 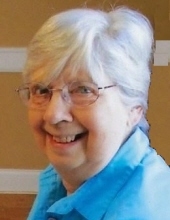 Those left to cherish her memory are her daughters: Pamela Baranski of Plymouth; Gina Baranski-Lancman of Dwight, Ill.; her son, Dean Baranski and his companion, Natalie Bilous of Denver, Colo.; she was further blessed with three grandchildren, Grace, Sarah and Emily Lancman. Marilyn Warzynski-Baranski was preceded in passing by her parents and her brother, Robert Warzynski. The Van Gilder Funeral Home is honored to be caring for the Warzynski-Baranski family. A memorial mass will be held for Marilyn Warzynski-Baranski at 11:15 a.m., Friday, March 16, in the Catherine Kasper Home Chapel, 9601 Union Road Donaldson, IN 46513 with Fr. John Zemelko. The Baranski family requests memorial contributions be made to Catherine Kasper Nursing Home Memory Unit in honor of Marilyn.